Laurie is pretty sure love at first sight doesn’t exist. After all, life isn’t a scene from the movies, is it? But then, through a misted-up bus window one snowy December day, she sees a man who she knows instantly is the one. Their eyes meet, there’s a moment of pure magic…and then her bus drives away. Laurie thinks she’ll never see the boy from the bus again. But at their Christmas party a year later, her best friend Sarah introduces her to the new love of her life. Who is, of course, the boy from the bus. 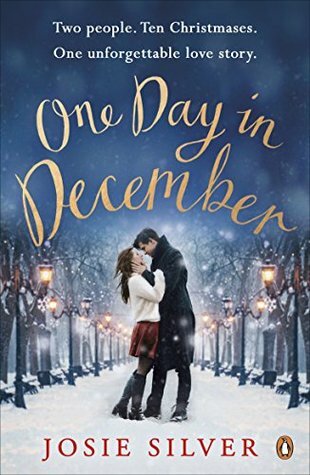 A romance novel about the idea of fate and of finding the one, One Day in December by Josie Silver is the story of two people who share a fleeting moment at a bus stop. Laurie is on the bus home across London on a cold December night, when it stops and she raises her head to look out of the window. There at the bus stop her gaze meets that of a handsome man, and she instantly knows that this is an important moment for both of them, that she has found the one. Before she has the chance to get out of her seat, the bus pulls away and she loses sight of him for good. Melancholic to say the least, Laurie spends the next year looking out for the man from the bus stop, getting best friend Sarah to keep a lookout as well. It is to her great surprise that when she does see him again it is in her own flat, on Sarah’s arm as her new boyfriend. Utterly at odds for what to say, Laurie pretends never to have seen him before and is unable to tell if he recognises her or even if he remembers the bus stop from a year ago. The man’s name is Jack, and he is just as surprised to see Laurie, having also been reminiscing about that cold December night. However, he is falling in love with Sarah, and Laurie’s attitude makes him think that he imagined the moment that passed between them. Instead, they become friends for Sarah’s sake and the book takes us through the course of their lives from that moment onwards. They live somewhat separate lives and yet somehow manage to stay intertwined throughout everything that comes their way. In that sense, this book is set up to be a drawn out romance between two characters who were always meant to be. That brief glance has changed everything, and Laurie’s romantic mind leads her to always be thinking about what could have been or what could still be. Regardless of the fact that her best friend is Jack’s girlfriend, Laurie is still tempted by him and tries everything she can to put him out of her mind. Even when she knows she shouldn’t, Laurie is there for Jack in his worst moments, trying not to overstep the mark or get in the way of him and Sarah. She tries to move on with her own life and find a partner of her own, and does a pretty good job of it too, if it weren’t for Jack’s constant presence in her life. It was this that I found the most difficult to read, as I felt very sorry for Laurie’s partner, who dotes on her and is unaware of what’s going on in the background. In the same way, I found it very difficult to like Jack as a character, as he always seemed a bit flaky or lacking in confidence to go after what he really wanted. He either wants Laurie or he doesn’t, but for the majority of the book he can’t seem to make up his mind, and only ends up hurting all those involved. To me, he wasn’t perfect partner material, and this only made it more difficult to read as I wasn’t rooting for the couple to get together at all – quite the opposite. Unfortunately this novel did not click with me, as I struggled with the characters and the premise we were meant to believe in. That said, the book is engaging and I wanted to read all the way to the conclusion. If you can connect with Jack and Laurie from the beginning then your opinion of this book may well be very different from mine, and I look forward to hearing some alternative opinions on the plot.